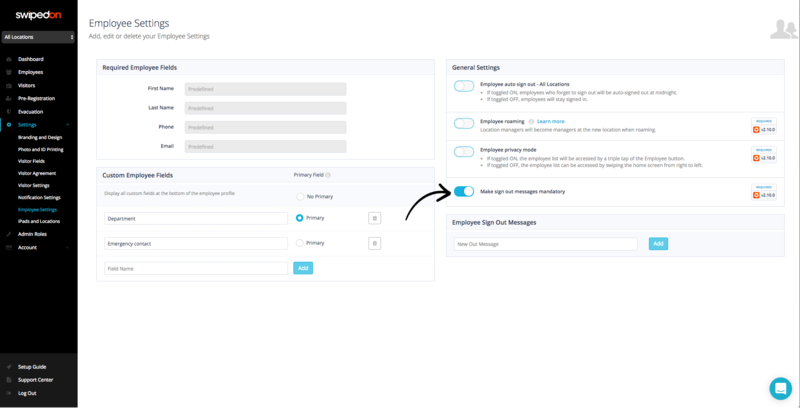 When 'Make sign out messages mandatory’ is enabled, ALL employees will be required to leave a sign out message in order to sign out. Enable 'Make sign out messages mandatory' by toggling to the right as displayed in the image below. 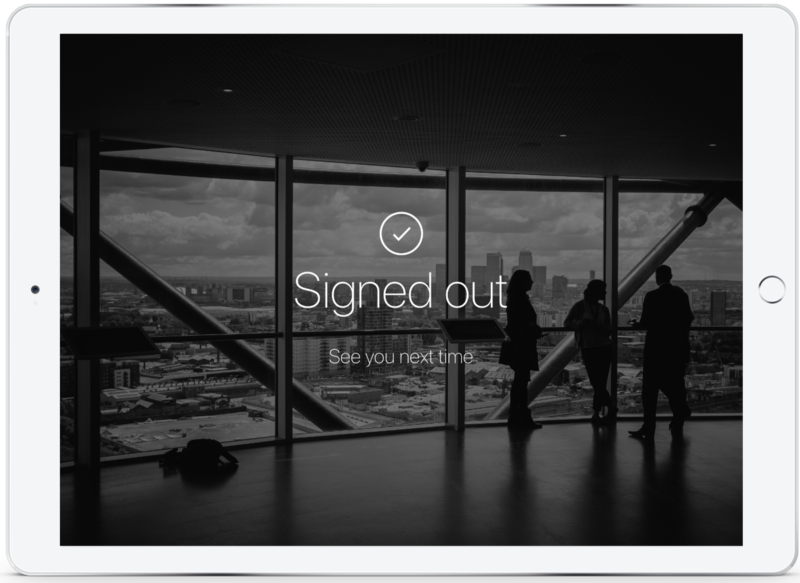 Once 'Make sign out messages mandatory' has been enabled, employees will be required to select a preset message or input a custom message when signing out from the iPad. Locate the ‘General Settings’ grouped options. 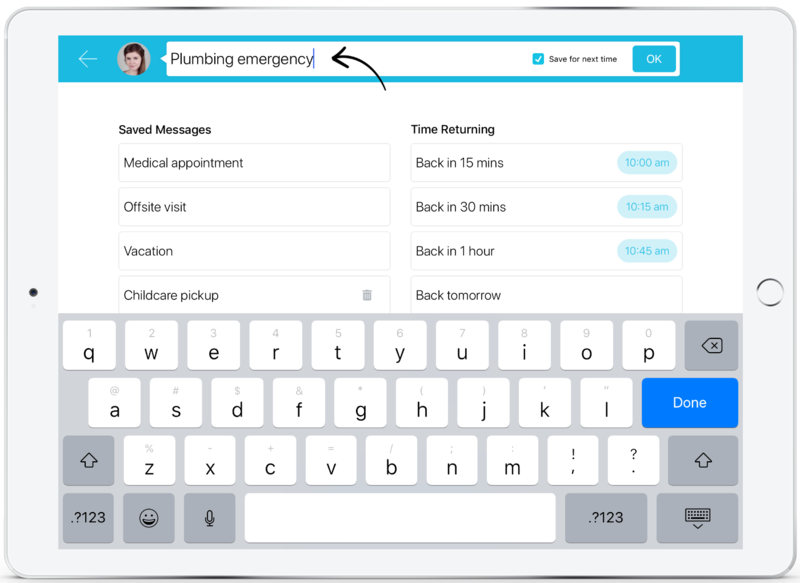 Simply input the message you would like to have appear on the iPad for the employee to select from in the ‘New Out Message’ and click ‘Add’. 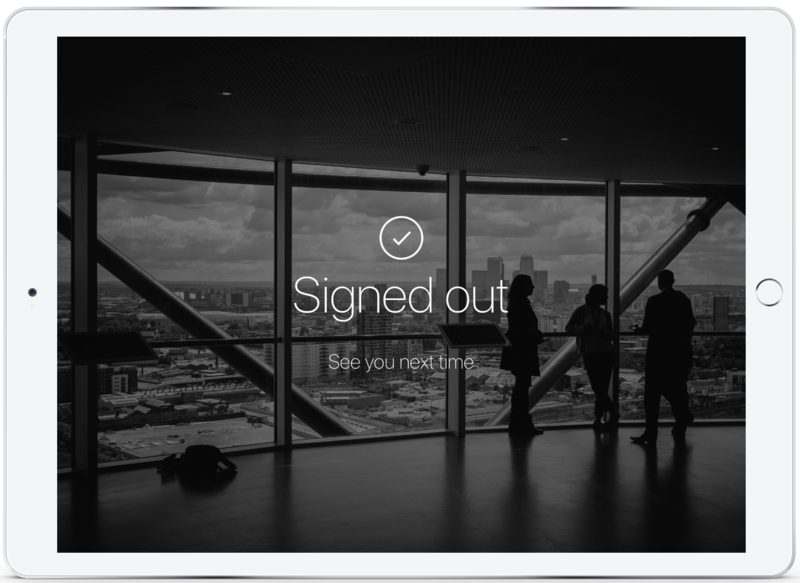 Once the employee sign out messages have been entered, these can be set against an employee's name when signing out from the iPad. Access the ‘employee’ sign in/out view and locate the name of the employee to be signed out and slide the In status from the left, to the right to show as Out. Once toggled to Out, the screen will display the sign out message option. Select a saved message that has been preset from the SwipedOn web dashboard, select a time returning and tap on 'Confirm’. The employee will then be shown the ‘signed out’ screen to confirm sign out was successful. The employee will now show as signed out with that message saved against their employee profile, to view this more of the employees details, simply tap on the employees image as shown in the below screenshot. Instead of selecting a preset message when signing out, the employee can also input a custom message when signing out if their reason for leaving does not fit into one of the preset message options. Once toggled to the Out status, tap at the top of the screen in the text field that shows ‘Enter a status message’. Once the message is entered as shown below, tap on the ‘OK’ button to the right of the message that has been input. 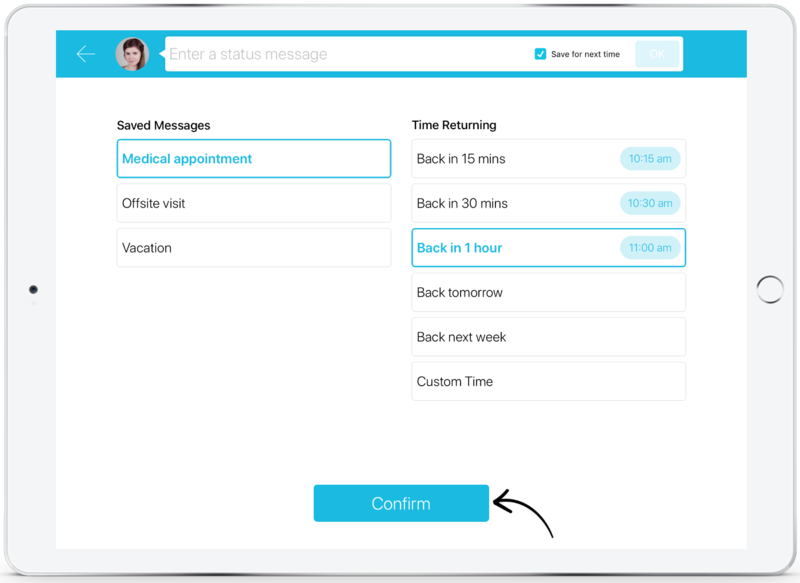 Once the ‘OK’ button is tapped, the custom message will now appear as a ‘saved messages’ option that is already selected, now select a ‘time returning’ and tap the ‘save’ button showing the arrow pointing to the right. The employee will then see the signed out screen below to confirm the sign out has occurred. 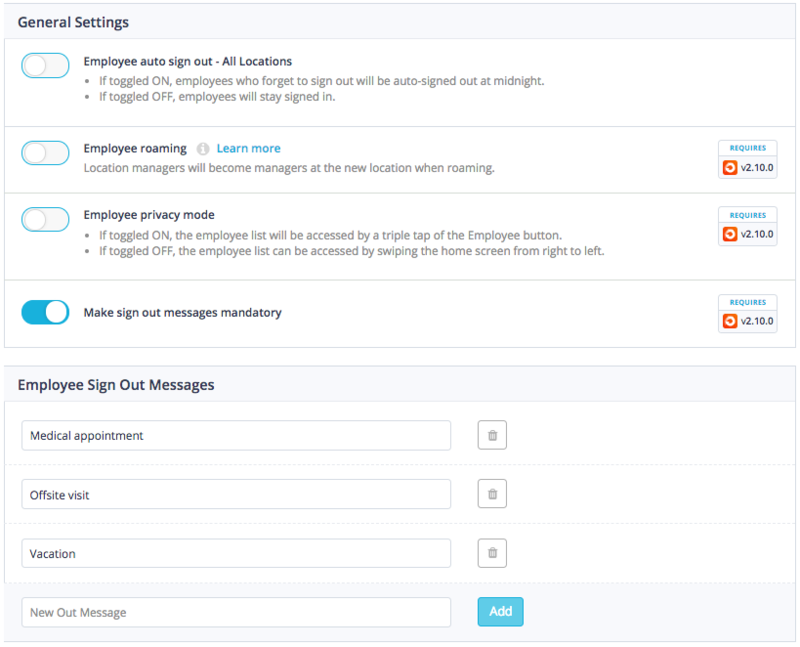 The employee will now show as signed out with that message saved against their employee profile. 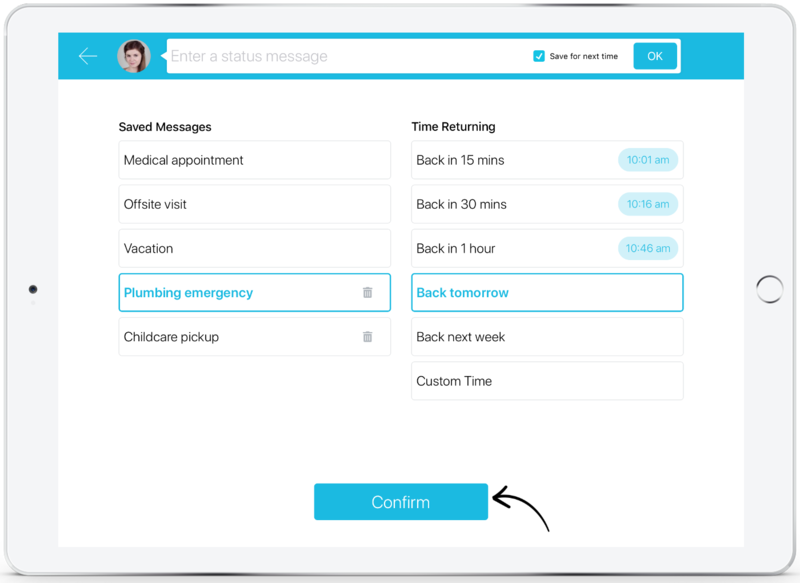 *Please note, the ‘save for next time’ option when setting a custom status will automatically be selected, to ensure this option does not show up as a saved reply again when that employee signs out, simply deselect by tapping on the check box. *Please note, for more information, we are available 24x5 via the live chat function in the lower right corner of the screen or get in touch via email over at support@swipedon.com.